My name is Carly Bowers. Sixteen years ago, my husband, David, was severely burned in an oxygen flash fire that happened at his work. At the time of the accident, our daughter was just days away from her ninth birthday and our son was two years old. For the next four months, friends and family members would care for our children as we focused on David’s physical needs at a burn unit that was almost three hours away from our home. While I don’t want you to think that I have all the answers, I’d like to share a few things that I found helpful while I tried to help our young children deal with the tragedy that struck our family. I think it’s crucial to be upfront and truthful with children, sharing age-appropriate details. Be careful not to say “everything’s going to be ok” because we don’t know how things will actually turn out. When our daughter asked me if her Daddy was going to live, my heart wanted to take her into my arms and comfort her with words that would make her feel safe and say, “Yes. He will be fine.” But in my mind I knew that I couldn’t tell her those things. I was devastated that as a Mom, I couldn’t take the hurt away and protect her from the uncertainty of our future. To be honest, this is one of the things I still struggle with today. But as we huddled in the Emergency Room, I hugged her, cried with her and told her that God would take care of us. That her Daddy was hurt really badly and that we were going to pray, but no matter what happened, our family would be comforted and taken care of by our loving God. I also felt like it was important to try to keep our kid’s lives as “normal” as possible. We found people (friends and eventually my father) to stay with our children in our own home so they could have the familiar surrounding them, when life didn’t seem very normal anymore. Our daughter could continue to go to her school, be around her friends, and they could continue attending our church. Familiarity brings comfort. Another way we tried to keep their little lives somewhat normal was when they would come visit us at the Burn Unit, we’d limit the amount of time they were at the hospital. There’s only so much time you can corral a feisty 2 year old boy in a hospital waiting room. When people would bring the kids up to see us, they’d normally spend the night with me because it took nearly three hours to make the drive. I’d spend some time at the hospital with our children and when David was healthy enough to be wheeled in the waiting room, he would visit with the kids for a few minutes before going back to his room. I’d leave and take the kids swimming or for bike ride or to a movie… We didn’t want their world to be filled with only hospitals, nurses and crisis. I had to learn that I needed to ask for help to meet the needs of our children. I didn’t try to do it all as a mom because there was simply not enough of me to go around. I had to rely on friends and family to virtually raise our children for 6 months. That’s not an easy thing to do. I was a stay at home mom when David got hurt. I loved being with my kids on a daily basis. Relinquishing these roles was painful. I felt guilty as a mom for not being able to meet their daily needs or protect them from the new reality we were facing. It’s also important to be sure to take care of the caregiver. If that person isn’t ok, the kids will struggle as well. Children model our behavior- if we are stuck in grief and bitterness, they will get stuck there too. If the caregiver is tired and stressed, then they will respond in a different, less patient manner. Try, however hard it may be, to make sure the caregiver gets enough rest, eats well and gets outside of the walls of the hospital and into the sunshine for a bit every single day. Caregivers need breaks from the demands of the hospital and they need to get renewed and restored on a regular basis so they can meet the needs of those closest to them. One of David’s buddies from college, Rob, was actually assigned to make sure I was taking care of myself, especially during the first few days at the Burn Unit. His gentle prodding early on, made me focus on the importance of continuing to take care of myself for the long haul. Today, our children are adults. As difficult as those first few months were after David got hurt, time has healed our wounds. There are still struggles and issues that we all deal with. As a Mom, it’s easy for me to look back and wish I’d done some things differently, but at the time I was simply trying to do the best I could. David and I have felt nudged to write our story many times over the years and we’re excited that our book, Walk Through Fire, is finally completed. We have come to realize that how we respond to the unexpected trials that God allows us to go through can greatly impact how successful we are in our quest to move forward and start living again. Pain is unavoidable, but we can choose to overcome suffering with a positive outlook and we can seek ways to find joy amidst our circumstances. We are so honored to have the opportunity to encourage others who are facing hardship. We thank Kids In The House for allowing us to share our story. We believe God can use our story to serve others, and I pray that you are encouraged. We believe in laughter, we believe in hope, and we believe in a God who brings light even into the darkest of places. In August of 1999, after being married for only five years, David and Carly Bowers faced the unthinkable when David was involved in an explosion at work. With over 90% of his body covered in second and third degree burns, he and Carly began the journey of healing that has brought them where they are today. 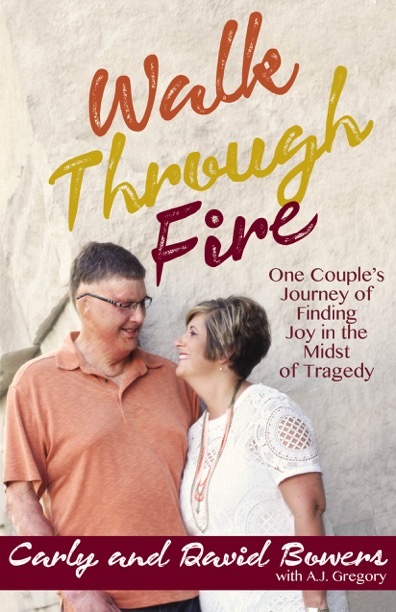 They’ve written their story in their new book Walk Through Fire, and continue to learn everyday that through faith, joy can be found even in the hardest circumstance.